Okay so I have no air bubbles or anything and I replaced the thermostat with a mazda thermostat and new hoses and clamps and a new water pump and new belts. The car just used to overheat but now its going through coolant. I noticed most of it going into the overflow. I am using a 13 lb .9 pressure cap on the thermostat housing. Anytime I run it without the pressure cap on it runs entirely perfect no overheat no anything. As soon as I put the pressure cap on it goes into the overflow and wont refill. 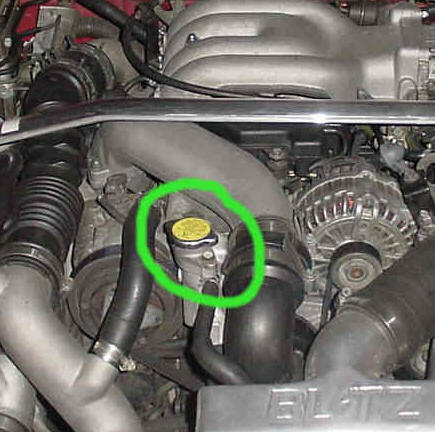 I noticed from pictures that most rx7s have a hose running to the thermostat housing like this one http://mahjik.homestead.com/files/FD...iller_neck.jpg . If not something like it. I don't mine is all solid. Can that cause the problem??? I have a 1988 GXL. From what you just said, it sounds to me like the obvious problem is that cap you're using. Try a different one. What mods do u have?